From the August 2018 Desktop News | As students explore campus this fall, they will notice Woods Quad’s newest resident: a 14-foot-tall, 1,500-pound white sculpture. 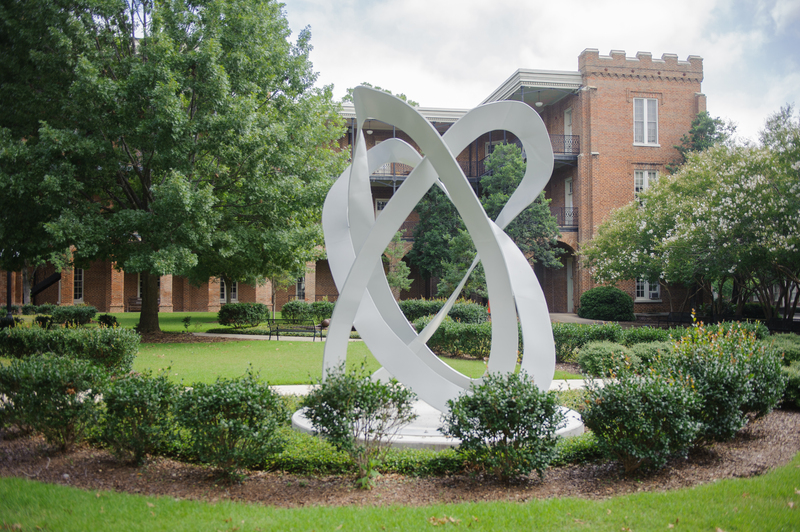 The sculpture, created by studio art minor Paget Kern, is the result of a collaboration between the art and math departments in an effort to display math more visually on campus.  The collaboration involved Dr. Cruz-Uribe and Craig Wedderspoon, a sculpture professor, as well as some of their art and math students, including Kern. Although they knew it would be tough going into the project, finding a balance between the two subjects seemed especially challenging. After months of collaborating and developing ideas, the team chose Kern’s design: three Möbius strips connected together in borromeo rings. A Möbius strip is an ordinary ring with a twist in it, making a continuous surface that requires one to go all the way around it twice before returning to the original point. The rings are then interlocked in a way that, if one ring was removed, the other two would no longer be connected, known as borromeo rings. Once the team landed on a design, Kern and the art department got to work on constructing the sculpture’s skeleton out of donated steel from the Nucor Corporation. Then, sheet metal was manipulated around the skeleton and the sculpture was assembled. Almost a year to the day after Kern began constructing her project, the sculpture was placed in its new home of Woods Quad, surrounded by beautiful plant life and other sculptures created or purchased by the College of Arts and Sciences. But for Cruz-Uribe, the best part of project was the interaction between the two departments.